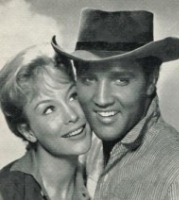 Barbara Eden Elvis C-o-Star in Flaming Star 1960 Elvis Presley Memories: Barbara Eden “I Dream of Jeannie” star Barbara Eden remembers Elvis Presley. For more private confessions from the women in Elvis’s life. Barbara Eden, “God, what a talent he was! I remember the first time I saw him. It was on television. I had a job dancing, and one of the girls took me home to rehearse, and her sister came running in the room and said, “Look! Look! Quick! Stop!” It was the Ed Sullivan Show. And he was just electric. 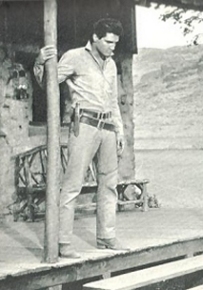 We ended up doing a western, Flaming Star 1960 together, when he first came back from the army. He was a natural on a horse. He was really good at it, as he was at acting. I think Elvis, like a lot of country entertainers, had his feet mired in emotional truth. When they say something, it’s right up front. You see it in Dolly Parton. The truth is right there. Elvis had that facility, and in his acting, he immediately became that character. He believed what he was doing, and he had no inhibitions about doing what he believed. And he cared. That’s what impressed me about Elvis. He cared so much about doing a good job, and knowing his craft. He was lovely man to work with. Good manners. He followed direction, he listened, and he was no problem. There wasn’t a huge ego. He wanted to please. But he did bend. He wanted to just act in this film, and not sing, but they decided they needed music and had him playing guitar while I hopped around the table at one point. He enjoyed doing that film, playing a half-breed Indian. The director, Don Siegel, said it was his finest performance ever. It ran opposite to anything he had done or would do in the future. And he was so good at it, and he got good reviews, but I don’t think the picture made a lot of money. And that’s too bad, because Colonel Parker was out for the fast buck. I remember the Colonel had a little desk set up, and he was selling Elvis’s records and memorabilia just inside the soundstage. I watched and I did a double take. I couldn’t believe it. Elvis said, “People talk about the Colonel a lot, but he’s been good to me. I was a nobody before I met him. I was playing little joints, and he made me what I am, and I appreciate it, and I’ll always listen to him.” And he did. We talked about a lot of things, like weight, because we were both watching what we ate. I said, “Well, you don’t have a problem. You’re very lean.” And he said, “No, no, my mama was heavy, and I take after her. 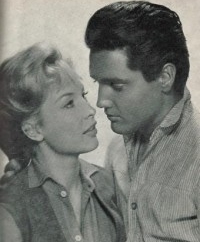 It shows in my face, so I have to be really careful.” I was married to actor Michael Ansara at the time, and Elvis asked me how difficult it was being married and acting. And I said, “It’s not tough at all. It’s our job. We just go our ways and do it.” And he said, “I’m really thinking about getting married, but I’m a little worried.” I said, “Oh, have you met someone?” He said, “Yeah, I met this girl. She’s awful young, though. I don’t know.” Of course, we know what happened later. He was a huge fan of Michael’s [Broken Arrow]. I said, “When do you ever have time to watch television?” And he looked at me and said, “Barbara, that’s all I do. I can’t go outside. I have to stay in the room.” I got the impression it was like a jail. The only time he was free and happy was when he was on the stage. When I met him on the lot he had his friends from Memphis around him, who were dear. He called them his cousins — some of them really were, I understand — and his father was there. They sat around in chairs and on boxes and sang. Elvis said, “We’re “pickin’.” They’d sing a little of this, a little of that. It was very pleasant. Everything was easy with him. And they were very good people. I have a picture, sitting there with his father and his cousins. Such nice memories. Michael did another film with him later on Harum Scarum, 1965 and Elvis was a little more outgoing, more sure of himself by then. He’d laugh out loud, for example. I sat with him for a while on the set. He was still the same basic good, sweet, malleable guy. Such a gentleman.